Every month we take a look at a movie on the Internet Movie Database’s List of the the TOP 250 FILMS OF ALL-TIME. These are movies that transcend a simple “My Favorite Scene” column. These are movies that are hard to just pry five gems from, but we do and examine the film overall. We’re on our seventh installment in this series. Click on the links for The Shawshank Redemption, The Godfather, The Godfather Part II, The Dark Knight, Pulp Fiction and Schindler’s List to check out previous installments. 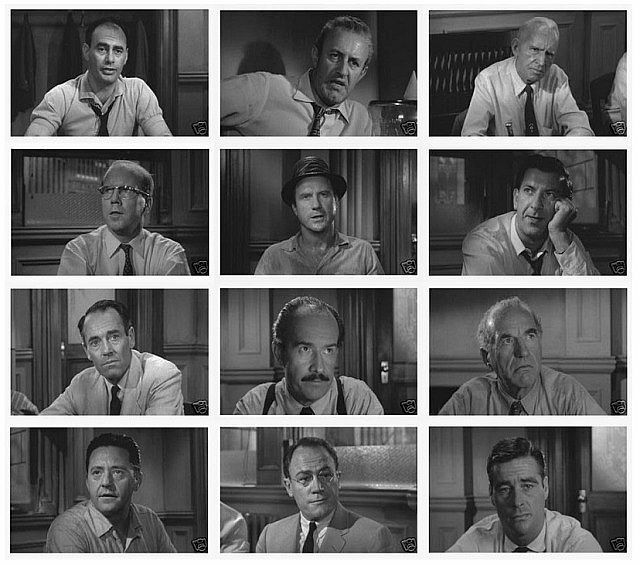 Nearly 60 years after its initial theatrical release, 12 Angry Men remains one of the most powerful, wisest and brilliantly composed motion pictures of all-time. Sydney Lumet’s adaptation of the stage play has 99% of the film in one room. It’s 12 guys just yapping at each other for 90 minutes, but yet it flies by as fast as any thriller ever made. Character development for each of these 12 jurors, stuck with deciding the fate of a young man charged with murder evolves naturally over the course of arguing back and forth the merits and flaws in the prosecution’s case. Henry Fonda begins as the lone hold out, but then he begins to poke hole after hole in the case and the tide of the jury swings his way. Most people would pick the last juror to be won over, and that’s obviously an iconic scene we’ll get to soon. Myself, I like an earlier moment, when everyone realizes that the fervor of one of the advocates of a guilty verdict is based on the fact that he’s one of “those people”. It doesn’t matter what he meant by that. It was prejudice. The other 11 men make the most noble choice you can make when faced with someone spewing that type of venomous, irrational hate…..they turn their backs on him. They don’t engage him in discourse, it’s not worth it. He’s not worth it. I wish we could practice this a little more instead of screaming at each other. Just turn away and don’t waste a second of your life arguing over something not worth the air you’d need to breathe a response to life. It’s just a small part of this film, but a powerful one, and my favorite scene in this classic. The other scene I referred to with the lone holdout, who sees his son in the victim and his failings as a father in the case, gives a fantastic monologue pleading his case to a silent audience that eventually echoes back on himself, and the verdict is reached. Henry Fonda first starts to chip away at the groupthink in the jury room with a simple demonstration. Part of the prosecution’s case hinged on the uniqueness of the knife. Instead of just accepting that, Fonda went out and found one just like it and the united front begins to crumble. 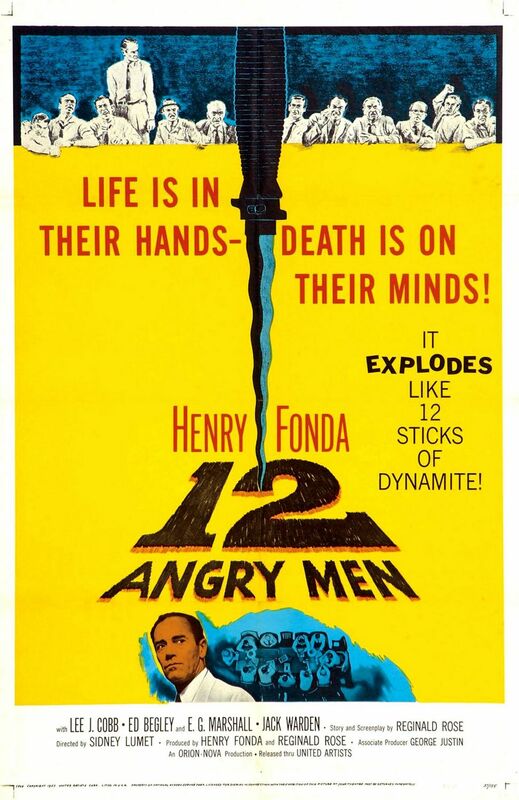 Here’s why it has to be 12 Angry MEN and not 12 Angry PEOPLE. 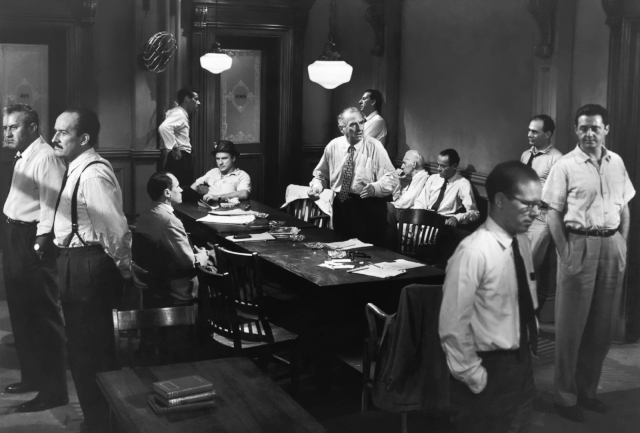 It has to be all men (for the record women make better judges and jurors, in my opinion) because as much as 12 Angry Men is a study of the judicial system, it’s study of the male dynamic. You put 12 guys in a room and just watch why it’s a good idea to have an integrated EVERYTHING. Fonda doesn’t come across as a plant for the defense or a legal scholar, just an ordinary man who takes his responsibility as a juror to the extraordinary extent we wish everyone did. Using the notes from the case, the group re-enacts the crime, simply and logically and erodes even more support from the GUILTY group. This movie is more relevant than ever, because ignorance can now find so many sounding boards in our everpresent media. But the brilliant thing about the film is that it doesn’t just comment on our society. Anyone, in virtually any civilization in the history of the world, would be able to relate to the social commentary in this movie, and learn from it. People have a tendency to not question their most deeply held beliefs, even though those beliefs are the ones with the most consequences by far. There are not enough people out there like Henry Fonda’s juror, so we need to keep ourselves in check. Henry Fonda needs to be a little voice in our heads, always. Like Atticus Finch.